Few months ago, I prepared lemon curd. I prepared this and this using it. But again, there was a leftover. Do you want to know what I did using the leftover? 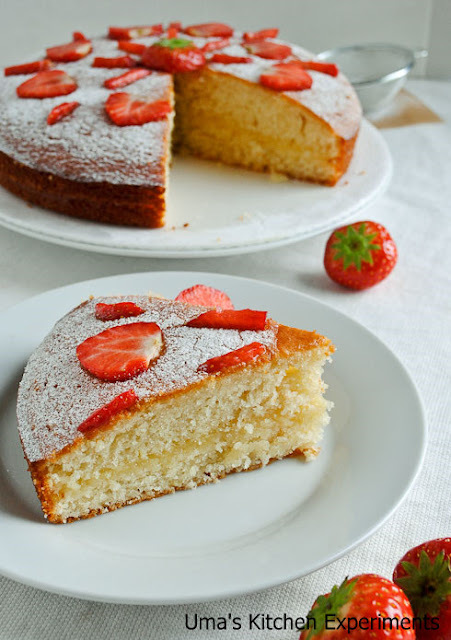 No surprise, I used as a filling for this french yogurt cake. I bookmarked this cake from Dorie Greenspan's Baking: From my home to yours. The texture of the cake almost looked like a pound cake and the taste was awesome though it is plain. 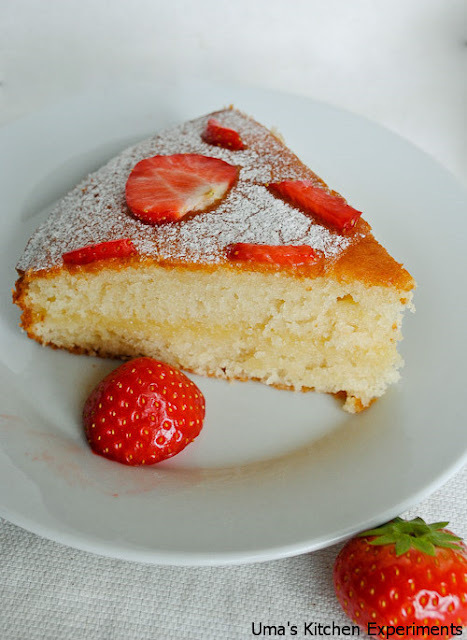 As it is less in sweet, I served it with lemon curd filling inside and icing sugar topping with sliced strawberries. They worked out wonderfully. Overall, the cake was very good in taste and in texture. 1) Preheat the oven to 350F/176C. Grease the 8 inch wide round baking pan or an 8 1/2 - 4 1/2-inch loaf pan or any other pan to which you comfortable with. 2) Mix together all purpose flour, ground almond, baking powder and salt. Keep it aside. 3) In another mixing bowl, combine sugar and lemon zest. Rub it until it gets moist and aromatic. 4) Add the yogurt, eggs and vanilla extract to it and whisk vigorously until the mixture is well blended. I did it one by one for proper mixing using a whisk. 5)After mixing egg, add the dry ingredients (as said in step 2) to the batter and mix well without forming any lumps. 6) At last add the oil and fold it well using a spatula. 7) You will get a thick, smooth batter with a slight sheen. Scrape the batter into the prepared baking pan(as said in step 1) and smooth the top using spatula. 8) Place this pan in the centre rack of oven and bake it for 35-40 minutes for the round cake or until the sides of the cake comes out from the sides of the pan. 9) It will be golden brown in colour and the knife inserted into the center of it should come out clean. 10) Cool for 5-10 minutes and transfer to the wire rock to cool completely. 1) Make a horizontal cut and divide the cake into 2 parts as bottom and top. 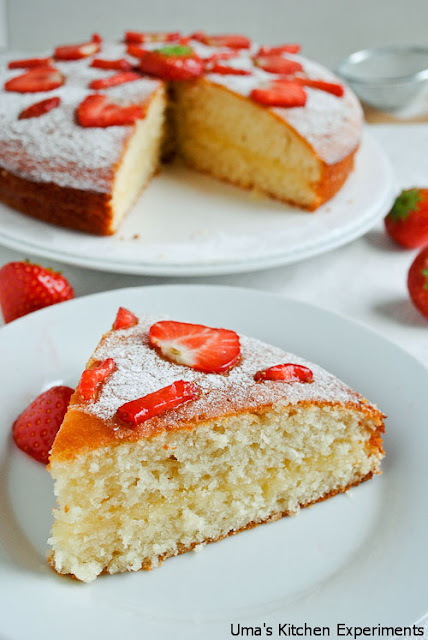 Apply lemon curd filling on the bottom part of the cake as shown in the picture. 2) Place the top portion above it and sprinkle with icing sugar. 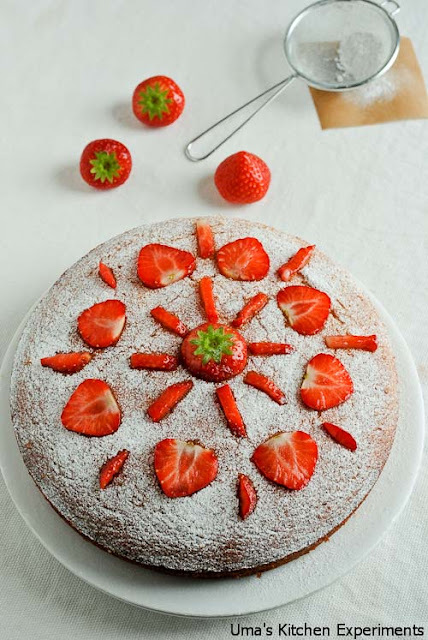 3) Decorate with strawberry and serve. 1) You can also use home made almond flour for 'ground almond' or substitute with all purpose flour if you don't have. 2) It took only 35 minutes for me to get the cake done. However, please keep noticing to the cake since the baking time changes from oven to oven. 3) Without topping I stored this cake in refrigerator for a day. It was very good even after storing. ah a beauty that is. looks wonderful. beautiful decorations. Looks yummy! Nice clicks uma! Looks perfect Uma, beautiful clicks. Delicious and lovely looking cake. Wonderfully prepared. Thanks a lot for sharing this lovely recipe. wonderful looking n such an beautiful looking cake.. Pretty cake with tasty filling.. cake looks very soft and moist..
OMG... seeing lot of wonderful baked goodies in many blogs makes me want to bake something sweet!! Lovely cake!! Pretty cake Uma. Hope you have settled down and enjoying the heat !!! Am your recent follower...u have a fabulous space ..visit mine too when free..